Dubai’s Mall of the Emirates, a leading shopping and leisure destination, has introduced WeChat Pay, the integrated payment feature in one of the world’s largest standalone super app WeChat. Mall of the Emirates has also become the first shopping and lifestyle destination in the UAE to own a verified WeChat official account. WeChat is a multipurpose messaging, social media and mobile payment app by Chinese technology company Tencent, which boasts 1.083 billion monthly active users. As part of its efforts to enhance convenience and elevate the shopping experience for the destination’s growing Chinese visitors, Mall of the Emirates now offers the seamless e-payment facility to customers who use WeChat. The service is made possible in the UAE through Royal Cloud Pay, which provides retailers the ability to accept payments made by mobile devices using WeChat. With key brands at the mall already on board, Mall of the Emirates is working to secure the adoption of WeChat Pay among many more retailers in the coming months. WeChat is the most popular social networking app among Chinese citizens. Roughly, 83 per cent of all smartphone users in China use the app for everything from chatting to making purchases. More than 9 out of 10 Chinese opt for mobile payment over cash, with WeChat Pay being the preferred choice. Mall of the Emirates’ initiative to offer this cashless payment option supports Dubai’s recent efforts to attract Chinese citizens and make the emirate the preferred destination for Chinese travellers. “In this age of connectivity, we are continually diversifying our services to make it convenient for our shoppers to access all that we have on offer at the click of a button. To own a verified WeChat official account allows us to be closer to our valued Chinese consumers who use this social network to get all information,” said Fuad Mansoor Sharaf, managing director for Majid Al Futtaim Properties - Shopping Malls (UAE, Bahrain & Oman). “We are also very proud to announce our collaboration with Tencent to offer simpler digital payment solutions through WeChat Pay. Having this e-wallet feature at the mall is a significant step in enhancing our Chinese visitors’ experience and create great moments whenever they visit. They can also take advantage of customized services and a wide range of choice, from the best hotels to family leisure options all in one place,” he said. Ahmad Al Khaja, the CEO of Dubai Festivals and Retail Establishment said: “Our strategic partnership with prime lifestyle destination, Mall of the Emirates and WeChat Pay will allow us to provide innovative and customized experiences with seamless payment options offered through the integrated social platform. Mall of the Emirates has become the first mall in the country to own an official verified WeChat account. Users who follow the mall on the social network will receive updates on discounts and entertainment, bespoke offers, and access to the store directory and services. The mall will also run a “Red Packet” rewards programme for users of WeChat Pay. 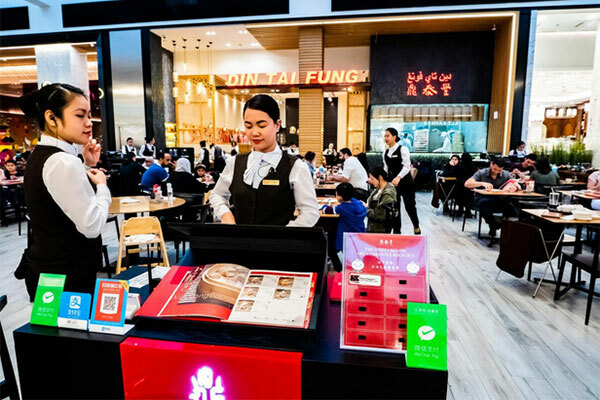 Based on the Chinese tradition of hongbao (monetary gift to loved ones), WeChat users in China will be able to scan Mall of the Emirates’ QR codes throughout the year and receive a coupon which can be redeemed for shopping at any of the stores at the mall.